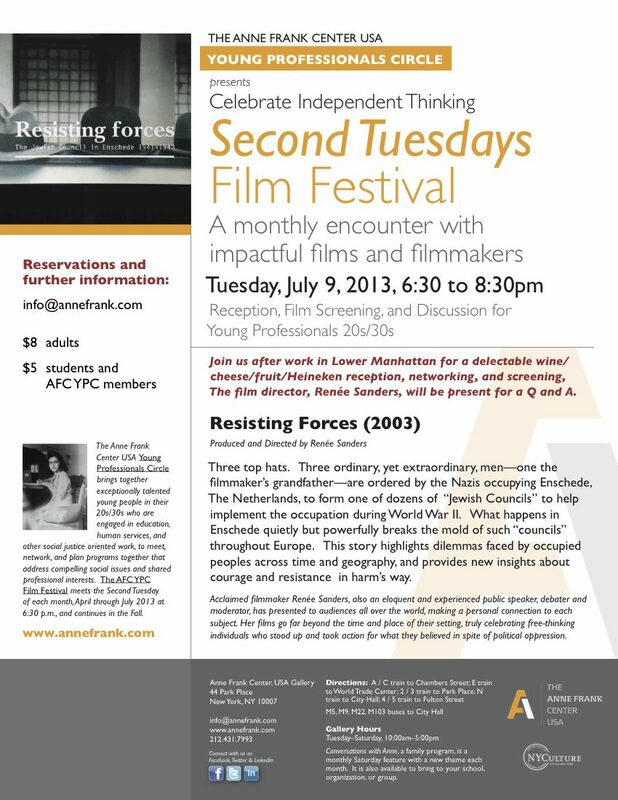 Reception, Film Screening, and Discussion for Young Professionals 20s/30s of Resisting Forces (2003), produced and directed by Renée Sanders. Wine/cheese/fruit/Heineken reception, networking, and screening. The film director will be present for Q and A. Three top hats. Three ordinary, yet extraordinary, men—one the filmmaker’s grandfather—are ordered by the Nazis occupying Enschede, The Netherlands, to form one of dozens of “Jewish Councils” to help implement the occupation during World War II. What happens in Enschede quietly but powerfully breaks the mold of such “councils” throughout Europe. This story highlights dilemmas faced by occupied peoples across time and geography, and provides new insights about courage and resistance in harm’s way. Acclaimed Dutch filmmaker Renée Sanders has presented to audiences all over the world, making a personal connection to each subject. Her films go far beyond the time and place of their setting, truly celebrating free-thinking individuals who stood up and took action for what they believed in spite of political oppression.